A SUSPECTED illegal gold miner at Kensington in Bulawayo died after he was shot by police when a gang of about 20 panners allegedly charged at detectives brandishing machetes, axes, picks and shovels. The confrontation occurred close to a plot on Saturday around 7AM. The incident is the second in two weeks in which police in Bulawayo have allegedly been forced to shoot after being attacked by panners resisting arrest. Sources said the aggressive panners ignored three warning shots and ran boldly at the police, prompting one of the detectives to shoot at them. The bullet allegedly struck a panner and he was rushed to the United Bulawayo Hospitals where he died hours later. The gang allegedly fled in different directions and police arrested three. The owner of the plot where the shooting occurred said she did not know anything but only heard gun shots being fired about 500 metres from her house. Terrified residents told The Chronicle yesterday that they heard police had come to the area looking for a murder suspect. “We heard police arrived at the plot after receiving information that one of the suspects linked to the death of a panner (Howard Sibanda, 19, who was stabbed and struck with a pick a week ago by fellow miners in Hope Fountain) was at the plot,” said a resident who declined to be named, fearing reprisals from the gold panners. 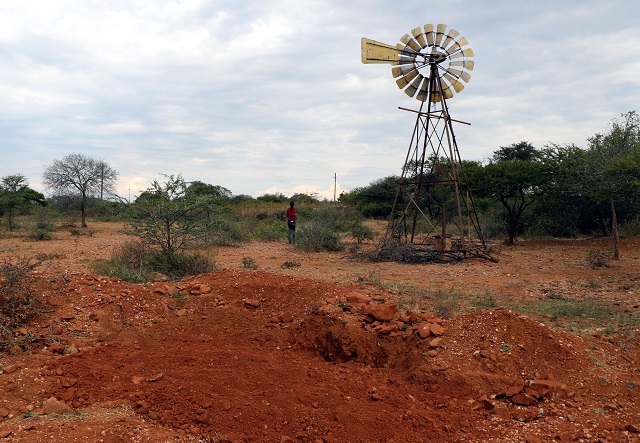 Residents said they lived in fear as the illegal miners target homesteads without men knowing they can easily threaten them and prospect for gold on their land. “About 200 illegal miners invaded that plot (pointing at the piece of land) last year. They dug up the whole area which was for grazing,” said a resident. Another resident said they heard gunshots and later heard that the illegal miners who were mining gold at a nearby plot had attacked the police. Residents said the panners were violent and often threatened to kill anyone who tried to chase them away from their plots. “They once told me that it had been a while since they had spilled blood and would not hesitate to do so if I continued fighting them. “We were even afraid to come out of the house at night because after chasing them they would come at night. At one point they struck my granddaughter with a huge rock and she spent three months in hospital,” said a resident. National police spokesperson Chief Superintendent Paul Nyathi said he was not aware of Saturday’s shooting. “I’m yet to receive a report,” he said yesterday. Police have since arrested Dumisani Ndlovu (25) for the killing in Hope Fountain while Bhekinkosi Ndlela and Brighton Nhliziyo are at large and one of them is suspected to have been at the plot at Kensington. At Hope Fountain, the gang allegedly attacked police on Sunday last week and Ndlovu was shot. Ndlovu, who allegedly fatally stabbed Sibanda and struck him with a pick at Lonester Mine in Hope Fountain, was with Prince Mwale (33) who was wanted for assault when police opened fire on them.